Puerto Calero villas - Puerto Calero is only a short distance away from the popular resort of Puerto Del Carmen but the difference in the resorts is very noticeable. Puerto Calero is a much newer resort and boasts an impressive and very popular marina for that can berth motor yachts up to an impressive 75 metres in length. 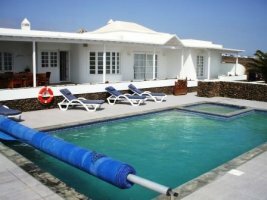 Boasting a great selection of luxurious Lanzarote villas. There is an excellent choice of Luxury villas to rent here and the whole area has been impressively landscaped making it a joy to both casual visitors and those enjoying a villa holiday in the resort. There is also good choice of restaurants to choose from in Puerto Calero as well as an excellent selection of quality boutiques, featuring names such as Hugo Boss and Helly Hansen. Browse our selection of Puerto Calero holiday villas below. Villa Puerto Calero is stylishly furnished and finished and is located in the upmarket resort of the same name. Special offers available for summer 2012. Modern, stylish villa located in the prestigious resort of Puerto Calero. Impeccable modern villa with separate apartment located in the upmarket marina of Puerto Calero. Four bedrooms, four bathrooms, sleeps up to eight people.